Fire Protection Shop supply high quality 19mm and 25mm Fire Hose Reel Tubing, manufactured in the UK and approved to EN 694 which replaced the BS 3169 standard. 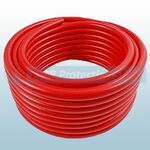 All our Fire Hose Reel Tubing is Thermoplastic covered, having a working pressure of up to 12 bar and will operate within the temprature range of -20 to +60 degrees centrigrade. If you require prices on longer lengths please give us a call on 0800 3161469 where a dedicated consultant will be happy to assist you with your enquiry.